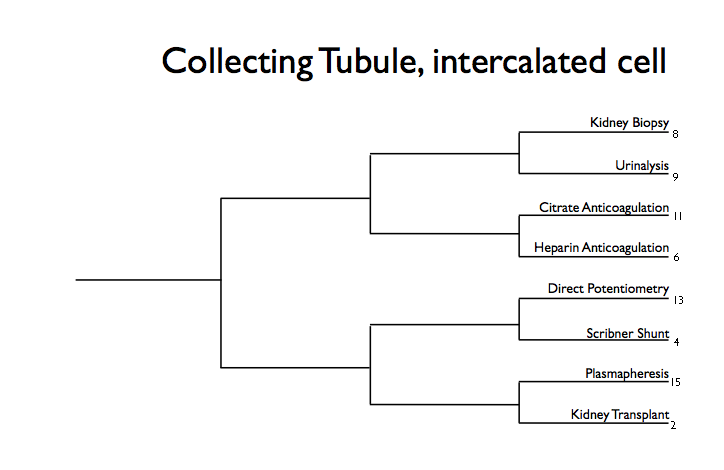 Nephrology Madness: Meet the competitors for Collecting Tubule Region’s Intercalated Cell Group! 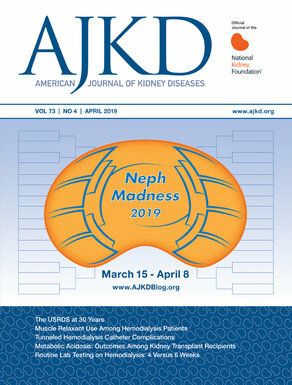 This is an interesting matchup that pits the most invasive procedure in diagnostic nephrology, the kidney biopsy against the nimble but vague urinalysis. Both are cornerstones in nephrology. This will be a tough battle. Lets take a look at the matchup. The kidney biopsy and its pathological description is completely intertwined and entrenched in the field of nephrology. However, it is relatively new compared to the urinalysis. This was because it wasn’t until the advent of the needle biopsy was it possible to sample kidney tissue in a living patient. The procedure was first reported in 1951 by Iverson and Brun in the American Journal of Medicine. Before this, most forms of kidney diseases were termed Bright’s disease. This was named after Dr. Robert Bright of the 1870’s and was based on the terminal appearance of end-stage fibrotic kidneys on pathological examination during autopsy. The entire field of renal pathology was born out of the technique of examining pathology specimens through out the natural history of the wide spectrum of kidney disease. There is, however, risks involved with kidney biopsy. Namely, that is bleeding. A recent meta-analysis and review of the literature was published in the American Journal of Kidney Diseases examining this issue. The kidney biopsy itself is a mainstay of nephrology and is integral to the diagnosis and treatment of many conditions. The interpretation of kidney pathology is also important. This is one of the attractive parts of nephrology. The monthly kidney pathology conferences where nephrology fellows sharpen their skills is a right of passage. It is a unique to nephrology and as such has a prominent spot in nephrology training programs. Sanskrit medical works from 100 BC describe 20 different types of urine. Hindu cultures were aware that some people’s urine tasted sweet, and that black ants were attracted to this sweet urine, a characteristic of diabetes mellitus. The word diabetes, which stems from the Greek word siphon, was coined by Areteus the Cappadocian in the second century. The urinalysis is cheap, non-invasive and helpful to making the diagnoses in a wide range of conditions. The “poor man’s” biopsy is here to stay. Heparin is a front runner in terms of anticoagulation during hemodialysis. Heparin is a naturally occurring anticoagulant produced by basophils. Heparin is not absorbed secondary to its negative change and large size and must be given parenterally. Dialyzer clotting is a common factor underlying poor performance especially with dialyzer reuse. This results is loss of the dialyzer and more importantly time lost during dialysis. This use of heparin is paramount to prevents thrombosis in the circuit. Benefits: Widely used, easily understood by most physicians and nursing staff, easy to monitor using PTT. Disadvantages: Risk of bleeding increasing in the uremic state, heparin induced thrombocytopenia. The new kid on the block is citrate anticoagulation for both outpatient and continuous forms of dialysis. The fall in the free plasma calcium concentration induced by binding to citrate is responsible for the anticoagulant activity of this regimen by preventing the progression of the coagulation cascade. The citrate-calcium complex is removed across the dialyzer and a calcium free dialysate can also be used to further reduce the free calcium level in the blood. Benefits: No excess risk of bleeding, studies show equal comparison to heparin, no chances of heparin induced thrombocytopenia. No heparin, no HIT. Disadvantages: hypocalcemia, hypernatremia and metabolic alkalosis, harder to monitor and no set parameters. Before Belding Scribner and his team developed the arteriovenous shunt in 1960, end-stage kidney disease was always fatal. Read that sentence again and think about the number of lives Scribner touched, changed and saved. Dr. Willem Kolff created the first successful dialysis machine in Nazi occupied Holland. Though his first 16 patients died, he kept hooking victims to his contraption of sausage casings, orange juice cans and a washing machine. In 1945 after dialyzing a woman for 16 hours she woke up. In the 50’s Kolff teamed with Peter Brigham to make a second generation machine, the stainless steel Kolff-Brigham kidney. This primitive form of dialysis required sacrificing an artery and vein for every treatment. A patient could receive five to seven treatments before he would literally run out of places to connect the machine. This limited the use of dialysis to episodes of reversible kidney failure. Chronic kidney failure was still a death sentence. Belding Scribner invented a U-shaped tube that could be permanently installed between an artery and vein of the arm. During dialysis the shunt was removed and the artery and vein were attached to the dialysis machine, this could be repeated over and over again. The key to the success of the shunt was the use of a new material that was not predisposed to blood clotting: Teflon. So the next time you’re frying an egg on a Teflon pan think of Belding Scribner pounding out creative ideas that changed the world. Interesting matchup—I wonder who is the underdog here? Is it kidney transplantation, the best treatment for end-stage kidney disease, or plasmapheresis, the only way to quickly get rid of pathologic antibodies? Let’s look at the evidence. This matchup places kidney transplantation, the best treatment for end stage kidney disease, against plasmapheresis, the only way to quickly get rid of pathologic antibodies. Let’s look at the evidence. Kidney transplantation has revolutionized the treatment of ESRD and led to numerous advances in immunology. The first successful kidney transplant was in December 23, 1954 by Dr. Joseph Murray who performed a living donor transplant from one identical twin to another. Transplantation led to an understanding of the immune system and the HLA system. Numerous drugs have been given birth in the field of transplantation including the first monoclonal antibody approved for clinical use – OKT3. Ok, so OKT3 is not used anymore but look at other wonder drugs like cyclosporine and mycophenolate mofetil! Transplantation is much better than dialysis when it comes to patient mortality and quality of life. With over 90,000 people on the transplant waitlist people are dying everyday to obtain a transplant. Just ask anyone with ESRD just how important kidney transplantation is. When this treatment stepped into nephrology it instantly became a game changer! Plasmapheresis removes antibodies and other proteins in the blood. It came about in the 1950’s and has been used for numerous conditions. In nephrology this includes pauciimmune GN, where it has been found to be as efficacious as high dose methylprednisone, and anti GBM disease. When a disease affects both the kidney and lung – plasmapheresis is the MVP! It can also be used to treat catastrophic antiphospholipid syndrome but does not seem to help against severe lupus nephritis. Although it is paired against kidney transplant it actually works with a kidney transplant when threatened by antibody mediated rejection. In addition plasmapheresis helps facilitate transplantation in the face of a positive crossmatch. Finally it is also the treatment of choice for thrombotic thrombocytopenic purpura. In most situations the power of plasma exchange is not necessary but lets face it – when you have a really bad renal disease you definitely want plasmapheresis on your team! Congratulations! you have seen all of the round 1 matchups!